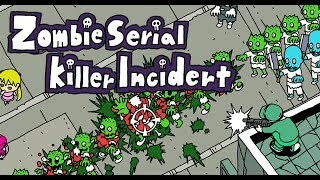 Zombie Serial Killer Incident on the Playism Store | Bringing a different breed of indie game to the world. Blow them zombies up real good with a single mouse click! Simple, yet deep―get ready for a new type of zombie shooter! Various types of zombies can be found walking/running/shambling around the screen. Take aim with your trusty shotgun and blow them to bits. Blow them zombies up real good with a single mouse click! Simple, yet deep―get ready for a new type of zombie shooter! Various types of zombies can be found walking/running/shambling around the screen. Take aim with your trusty shotgun and blow them to bits. The days passed by, quietly and peacefully. But all it took was a seemingly insignificant occurrence to throw everything into chaos. Her small town transformed into a world of terror, crawling with zombies. The zombie hordes appearing everywhere are being systematically decimated before the young girl’s very eyes. Just what is going on...?! An unprecedented tale of click-based action and suspense is about to begin. Sends his hatchet flying when killed. Time to bust out some combos! Their cutting-edge headgear protects them from bullets! These guys can only be killed by a well-timed zombie explosion. Shooting the zombies causes them to explode. This explosion can take out other zombies as well. This is actually your best bet for taking them out in numbers. You can’t beat the game simply by shooting zombies randomly. Aim wisely, and shoot, uh... wisely-er! Can you clear all 50 stages (plus the three extras)?! You can find the HTML version of HELP files inside the installation folder for more information. What do you think about Zombie Serial Killer Incident? Shindenken is an indie game development circle that primarily creates action games. They are known for creating games that have employ a diverse range of technologies, such as cell automata and swarm A.I. They also work with a variety of platforms and have brought out both Qualia 1 and 2 on PS3, and a version of BiOruru was ported to the iPhone. Recently they have been active in the IGDA and a Japanese indie movement called Doujin24.